Recently Clyde's mom, Jazz, appeared on the Outdoor Channel competing in the DockDogs event at the Clark County Fair. If you go to this page and find the icon that looks like this, you should be able to see the video. Last time I checked it was on the top row, second from the right. 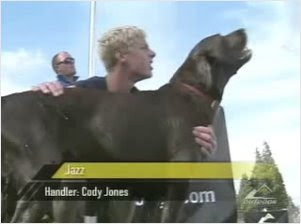 Jazz and Cody (the handler) ended up winning the event. Unfortunately this is lost on Clyde as he only understands food, balls, sticks and water. We are thinking that we are going to try this out with Clyde. We went to an event in Mill Creek this summer and it looked like a good time. There was some good camaraderie between the competitors and it was a blast to watch the dogs jump. Since it has been a bit, here is a recent picture of Clyde. 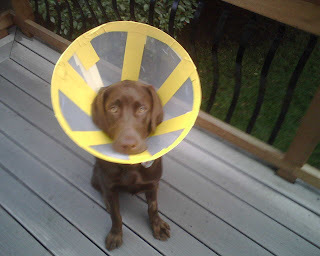 He was wearing the cone as he was recently neutered (de-balled). The yellow duct tape is on there because he was pulling his cone apart and killing the corners of my sheetrock. I got a little carried away with it. The guy is now 70 pounds and fairly lean... Hopefully the growing is pretty much done, but at 7 months old, I'm not holding my breath! Doesn't he look happy? LOL! I do not approve of the title, you are correct. He's stylin with the yellow duck tape!!!! I'd be pissed too if I had to wear that!!! ;) Good update!